Clive Barker is a name that lives in the heart of any horror aficionado. Hellraiser and Candyman are such milestones in the history of horror, they've stood the test of time and still reign at the very top of the genre, together with a few select others. Yet, after more than 26 years of producing invigorous stories that bends creativity into unheard of dimensions of the imagination, mr. Barker's best creations is still his debut collections of short stories, The Books of Blood. It is in these books that Candyman was originally conjured up, along with Dread, The Midnight Meat Train and Rawhead Rex, to name a few. 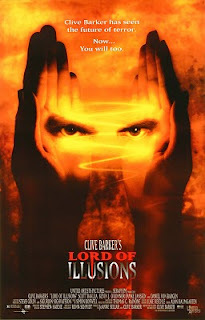 It is also from this same collection that Lord of Illusions came, yet for some reason it is one of the most over-looked Barker films. Many people complain about the rather sub par CGI that's included in a short scene, but common... this was 1995! The rest of the film more than makes up for that one slightly silly scene. The story is outstanding as ever, and Scott Bakula is perfectly cast as the run down private investigator of the supernatural. Parts of the soundtrack are so good I've used it for some of my own hobby-productions, and the whole movie is one big climax of awesome scenes. Very nice thank you so much and BTW for 1995 the CGI is very good in fact in my opinion still good even today.Of course I really like this movie,I had a copy a long time ago and loaned to a "friend"or "fiend" (lol) and never got back :( so Im happy to get here.